wave of mutilation. - Versicle. Have you seen this jacket zoomed-in? Yes, tiny houndstooth lining. I love it. Oh, and meet my new gloves. It was cold because before-and-after raining when I took these shots so I put on my gloves. Thanks for the great occasion, dear Lord. Love this walking pic, even it's blurry. Ugh. Not fair. ps. I'm thinking about dying my hair brunette/brown. I've wanted to do this for months but I'm not really sure yet that it would look flattering on me. What do you think? the color palette is amazing. And of course, the entire outfit look amazing. Gorgeous outfit, the print on that dress is beautiful! The dress is a perfect fit, nice job! I love the gloves, they add a cool touch! You should go for the lighter hair, it would be great for summer! ♥ your dress so much.. Pretty dress! I like the way you coordinated the colour with the hat and the purse. This is probably one of my favorite outfits that you've worn. I love the color palette & that dress is soo pretty! happy anniversary to your blog babe! You are sooo good at combining colors.This outfit is for sure amazing ! Love the purple hat and tan boots! if you don't, you can always change it back. I love the print of this dress and you have beautiful hair! Oh, the colors of your outfit is so refreshing! I love purple color. It really look good on you! Aww feel better! You look great in these photos; I love the purples. my fave baby! loving your gloves and the botts. <33 by the end of april.. we'll adventure the thrift shop again.. together... haha.. nek iso.. =p. i so love the gloves and the shoes, love love! dear you loooks so cute! love how you can sport the gloves, anyway! That is such a cute dress and you wear it so well! Hope you are feeling better! 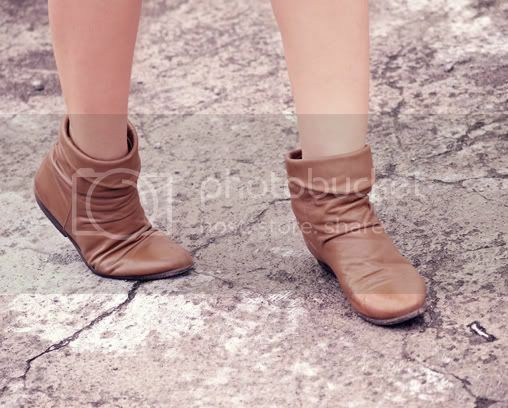 The boots are so so gorgeous! And your glove, hmmmm really want it! geez. i'm running out of good adjectives to describe your outfit kak..
that dress is so amazing. i love it with the tan gloves and shoes. Cute outfit! I love your blog which is why I left you an award on my blog!! So go check it out!!! Cute outfit! Love the colours of that dress!! ah your marvelously bright dress and accessories are simply delightful! i truly love the fact that you can take two colors [purple and tan] and make them completely fresh and springlike. i absolutely love reading your blog – keep up the amazing outfit posts! i think you should go for the hair color change! by the way, mind to exchange link? Mhmmm such a pretty dress! mind to Follow - exchange Link ? hey there :) i love your style! where did you buy that jacket? i know there r many thrift stores in Indonesia. Do u know which thrift store has that jacket? I love love love that dress. And the touches of tan are perfect with it! Love your outfit! Congratulations with your blog anniversary and keep up the good work, girl! I wouldn't dye my hair if I were you, because I love your black hair.. I love walking pics! So paparazzi like! :D. And I love these pastel colours of your outfit! Just great :). Congrats on the no nicotine! It must be tough, but that's really great. you look fantastic with this colors! no fair! u always look so good :P ur combinations are always great! You're so cute, I love your bows! Thanks for the sweet comment you left on my blog - sorry for the super late reply! Things have been so crazy recently. your shoes are brilliant,your outfit as well. I'm so loving the purple-and-brown vibes! you look so amazing! i love the complementary boots & belt and the pretty magenta color. Lovely outfit, great photo's too! i think you look gorgeous enough with jet black hair marla :D suits your skin tone very well .. the brown could make you slightly pale if the color is not suitable..
that dress is adorable!ps: i left an award for you on my blog. 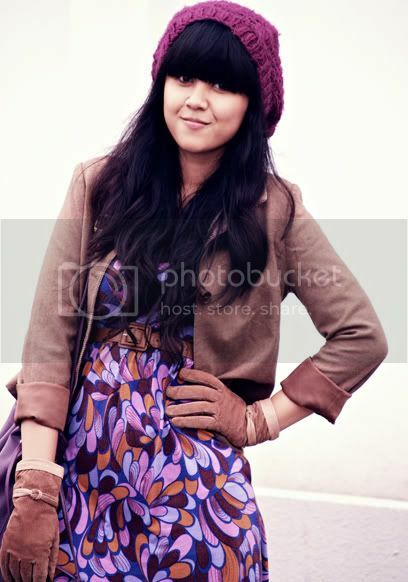 I love this outfit - it looks like something out of the 60s :) Jacketnya lucuuuu! all the brown is cute.anw,are you not feeling hot wear that gloves ? love the dress ! & ADOOOORE the gloves ! you've got a lovely blog, definitly following ! Lovely pictures! The color and print of that dress are amazing. And I absolutely love your gloves, they're perfect!